Central to the designer’s practise is the creation of a set within which to stage his cast. Richard Malone’s London Fashion Week show took us to an almost-uncomfortable, nearly-bleak living room in which a family birthday party sees ‘dressing up’ interpreted across generations. Malone speaks the language of bad taste, where words which would typically make the fashion-literate wince – ‘fuzzy’, ‘cuddly’ – are warmly embraced. 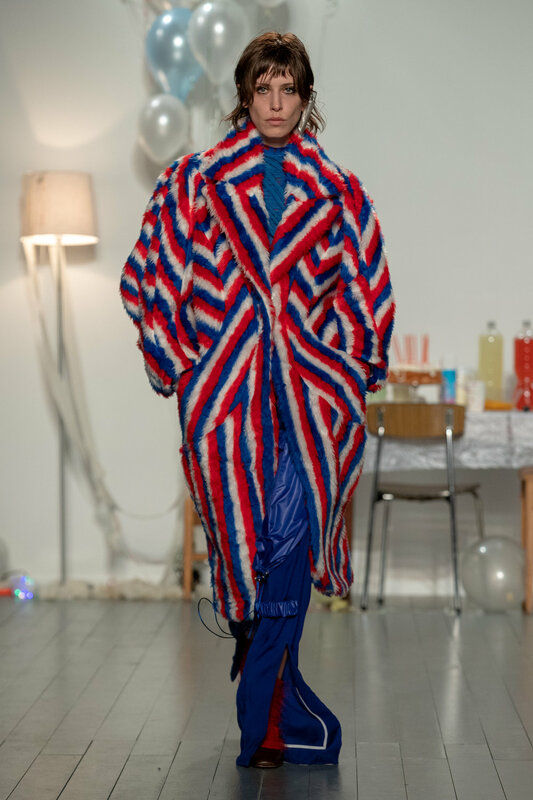 Striped stoles rendered in ‘fun fur’ are made from re-purposed dog beds, frock coats are fashioned from workwear twills typically found in school uniforms. Retro party plates inspired the prints seen across recycled, organic cotton jersey. Waste is limited - dresses are cut from precisely one metre of woven fabric and shaped through contouring by hand. Much of the colour palette takes cues from the tonal browns of ‘bad, mum lipstick’ and the optimistic brights of street party flags. Awarded an MBE by HRH The Queen in 2017 for Services to the Fashion Industry Alison has built a reputation as one of the leading supporters of emerging fashion talent. Alison is passionate about supporting creative talent and preparing them for the challenges of balancing creativity and commerciality. Renowned for her practical, realistic approach to running a creative business, Alison is constantly in demand to share her knowledge and advice. She acts as a consultant to brands across the globe from start-ups to established businesses, supporting fashion, music and design brands, retailers, manufacturers and training providers. Alison is a judge on the Great British Entrepreneur Awards and was named one of the Maserati 100 in 2016 for the support she gives to new entrepreneurs.